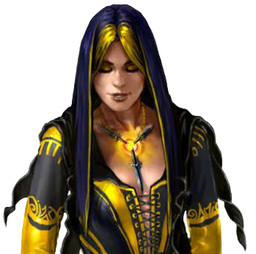 Dindreann is High Priestess of the House of Stolen Kisses in Quent, the center of Calistrian worship in the Shackles and one of its premier information brokerages. She holds many secrets, but never reveals them without a price. Charming and graceful, she loves games of intrigue, and is good friends with Tessa Fairwind. She is also said to be on good terms with the Wasp Queens.